While sailing on Hikianalia in this perfectly blue ocean water, I hear sounds of excitement coming from the bow. 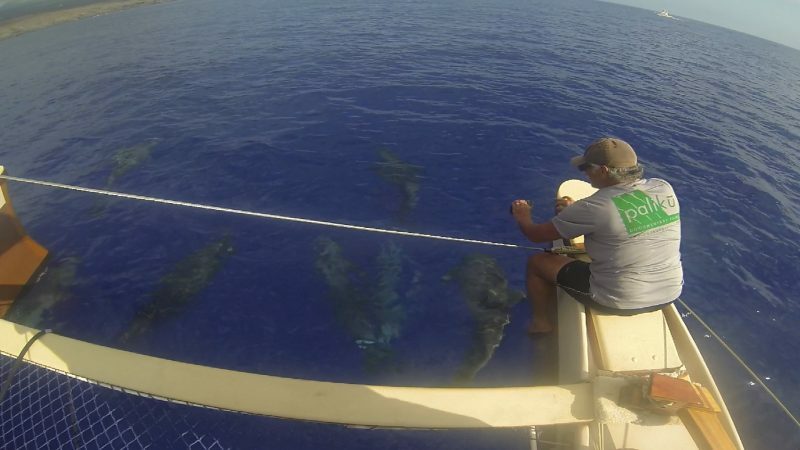 I run up to the bow and there they are, a pod of at least seven dolphins paying us a visit. I stood there for a moment, frozen, mesmerized by what I was seeing. When I snapped out of this dream-like state I pulled my Go Pro out of my pocket and hit record, walked up to the front cross beam of the canoe and settled on the net hung between the two hulls. The dolphins were incredible, they were so close, I felt like I could reach out and touch them. 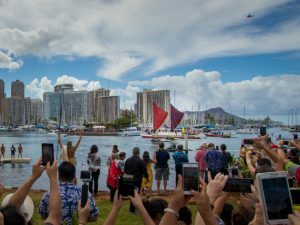 One of the dolphins swam directly under the front of the starboard hull and seemed to be rubbing its forehead on the canoe, as if it were giving Hikianalia a honi. So beautiful. 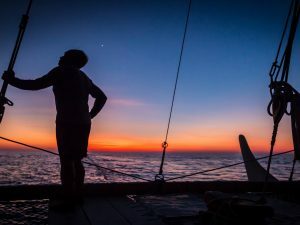 It felt like the canoe and its entire crew were wrapped in this sphere of warm, light, energy. I looked over at my watch captain Uncle Billy Richards and he was sitting on the starboard hull with his camera, looking as giddy as a child. Needless to say it was an amazing experience and one I will never forget.